What better way to kick off a meal than with one of our delicious starters. 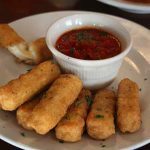 Lightly breaded with herbs served with marinara sauce. 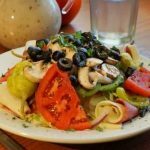 Lettuce, green peppers, onions, tomatoes, black olives, pepperoncini, mushrooms, pepperoni, salami, provolone cheese and cucumbers. A blend of yogurt, cucumber, garlic, sour cream & vinegar, served with warm pita bread. A tangy blend of feta, fresh garlic, olive oil & lemon juice, served with warm pita bread. 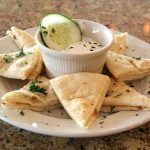 Filo dough filled with spinach, feta, scallions and fresh dill, served with meatless Greek salad. Homemade meatballs topped with meat sauce and melted cheese.